Finally, I had appliances that all matched. The stove, refrigerator, microwave, dishwasher, freezer, washer AND dryer were all white. And I was happy with my matching appliances that all (mostly) worked as they should. We had completed the appliance circle of life, and all was well. The washer started it. We knew it was on the brink of going soon….we have had the repairman out a few times to look at it, and the last time we were advised to buy a new one. Our repairman said that even if he fixed it, the fins at the back where the belt attaches were on the verge of breaking (it is a front-loader, but not a direct drive, for those of you who have an idea of what that actually means.) The Handy Man and I instead ordered two electronic parts, and he figured out which part it was, and I sent the other part back. Considering that one week’s worth of laundry costs me about $50 at the laundromat, the $100 part was totally worth it. The washer has worked well since then. It is loud, and it sounds like a jet engine revving when it is in the spin cycle, the door is cracked, and Curious George managed to pull the handle completely off one day when it wouldn’t open (because it was running), but other than that, it works great! So of all the appliances we own, we really thought it would be the washer that would go first. Ha. Appliances seem to have minds of their own in our house. Since my phone was off, I was completely oblivious to the drama unfolding at home. In retrospect, I should have known something was brewing. I asked the Handy Man if he could see why the front burner of the stove wasn’t working. Our stove was only about eleven years old, and even though I have used it a LOT, I expected at least another five years out of it. The oven had started being a little unreliable, but I honestly hadn’t given that much thought, other than to make a mental note (which I never remembered) to buy an oven thermometer to keep tabs on the cooking temperature. The girls and I had also been smelling the LP gas intermittently for several months. Not every day, mind you, but just often enough that I would mention it to the Handy Man, and then he would reassure me that he didn’t smell a thing. (That is funny, though, because his sense of smell is not very keen. For example, he rarely smells a stinky diaper.) That front burner, though, was an issue. I need all my burners to cook for this crew. So the Handy Man (who, as his name suggests, is actually very handy and has no trouble with things like fixing appliances–except for refrigerators–and has fixed most of our appliances at one time or another) set out to figure out the mystery of the broken burner. He cleaned out the burner and then tried to light it. It lit, and then it made a large WHOOSHING noise and blew out. It sort of scared him, but he thought perhaps he had a leak or something. 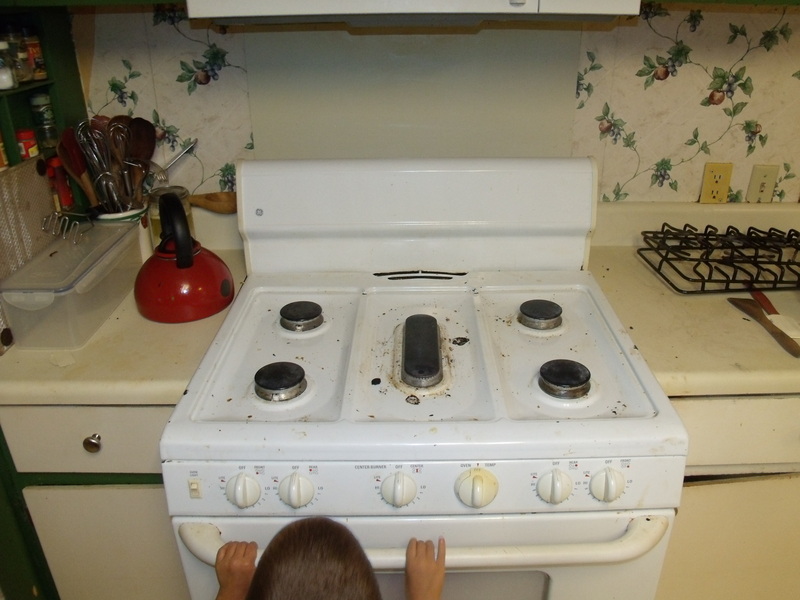 He examined every connection, used soap to check for bubbles, re-cleaned the burner, and tried again. Only this time it wasn’t a whoosh. This time when he turned the burner on, after a few clicks of the ignition, he observed flames coming from the seams of the appliance at the counter and back edge. Being an astute man, he immediately realized that something was very wrong. In that moment, the bottom panel blew out, the door flew open, and the cook top was lifted by a small explosion. He quickly turned the burner off, singing all the grey hair off his left arm. After checking his pants, he prayed a small prayer of thankfulness that our home was still standing, and that he did not have to tell me that he had burned our kitchen down. Now, here is the rub. We bought our last stove on a spur-of-the-moment when we were at HHGregg. We knew we wanted a stove, but I had not yet discovered Consumer Reports or user ratings for appliances. We had just gotten dial-up internet, if that tells you anything. As a result, I had no tools to help me discern which stove might be the best for us. 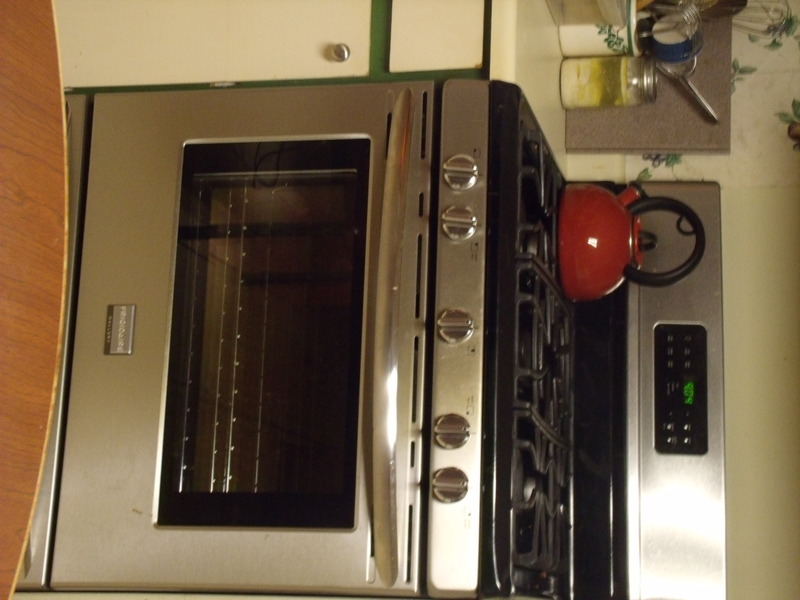 I really liked the one we got because it had five burners, and at the time, all I could think about was my huge canning pot and how handy that large middle burner would be. Never mind that it lacked a broiler. (I never gave the lack of a broiler a thought…until I wanted some good cheese toast. ) I knew that I was not going down that path again! So I logged into Consumer Reports and started looking at the stove rankings. I found the one I wanted: five burners, large oven, broiler, storage drawer, and WHITE. It was perfect. The Handy Man and I went to Lowe’s. I had my model numbers handy–both the one I really wanted and the back-up. Lowe’s didn’t have them in stock. They could order them both, but the lead time on them was 22 days. I know some people (bachelors come to mind) who can exist without a stove for 22 days. I am not one of them. Oh, I did think about it, but I kept coming back to the fact that I simply didn’t think I could cook for our family using a microwave, crock pot and small toaster oven for 22 days. Maybe we could use the camp stove, but I would have to set it up outside. So I did what any rational woman would do. I called my brother. Eric is my brother. I love him dearly for many reasons, and one of the reasons I appreciate him so is that he is always willing to look things up for me when I need some help. Can’t pick a math curriculum for my teens? Send Eric links to every well-known video program out there, and he will evaluate them for me! (He is a high school math teacher–it wasn’t a blind pick!) Need to pick a stove on the spur-of-the-moment while at Lowe’s? Call Eric! It turns out that none of the stoves Lowe’s keeps in stock were actually rated by Consumer Reports, although Eric was able to tell me which brands to avoid. I then started reading him model numbers, and he did his magic wizardry and found online consumer reviews. We found one that reviewed well. There was only one snag. It only came in stainless/black. So the Handy Man and I had a dilemma on our hands. Twenty-two days of make-shift cooking (during canning season mind you–tomatoes are coming in like crazy!) or a black and stainless stove. 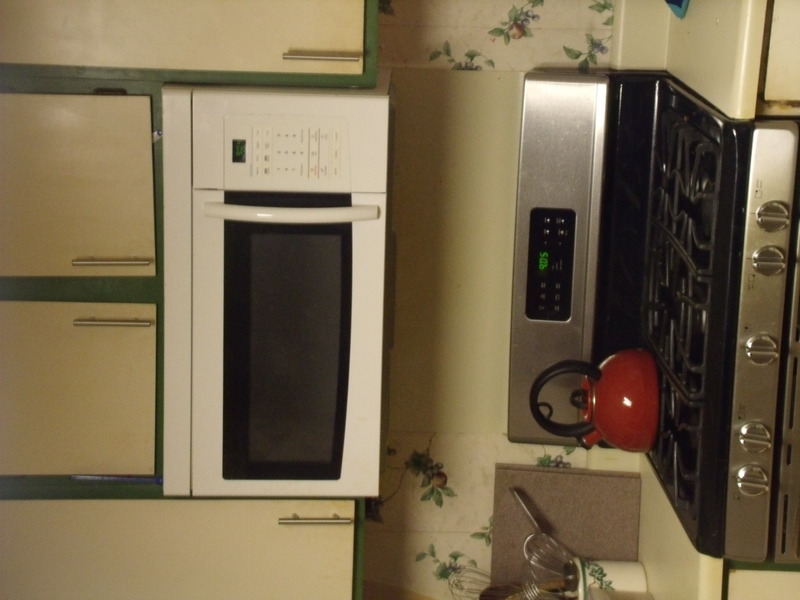 Remember–it took me fifteen years to get matching appliances. Was I really willing to start all over again? Yes. Yes, I was. We bought the stove. It sits proudly under my white microwave hood with the almond back splash (because the first stove in this kitchen was almond, as was our old microwave.) It looks completely out of place with my white french door refrigerator and my white dishwasher and my white freezer in the back corner. But, Oh JOY! It works! It even has a convection oven option. The burners work so well…we can boil a pot of water in five minutes instead of twenty! We can can tomatoes in so much less time. It bakes beautifully. And the center burner with its cast iron griddle top (removable) is a dream for making grilled cheese and pancakes. I’ve decided that matching appliances are overrated. Safe, working appliances are much better. And while it wasn’t in the budget (and neither is the washer, which is sure to go next because these things always happen in threes at our house–the only mystery is what the third appliance will be) we do have an interest free period with our Lowe’s account. At least the washer isn’t likely to blow up. The Handy Man is happy about that. He’d like to keep the grey hairs on his right arm.